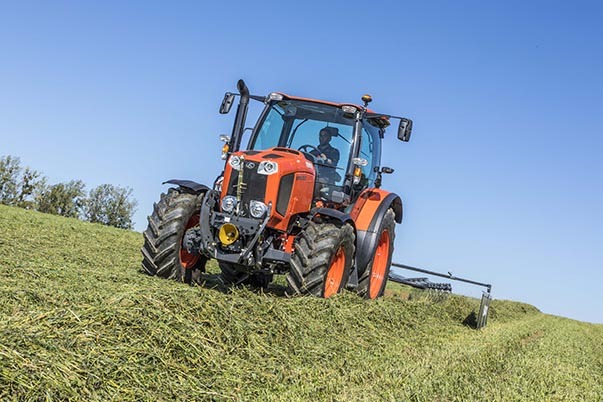 Under the bonnet of the five new Kubota MGX III models are engines that employ the latest technology to meet challenging European emission standards with confidence. The highly efficient engines are not only economical and clean, they also do not leave anything to be desired in terms of performance. On the contrary, you’ll be thrilled with the tractive power of the MGX III under demanding working conditions. 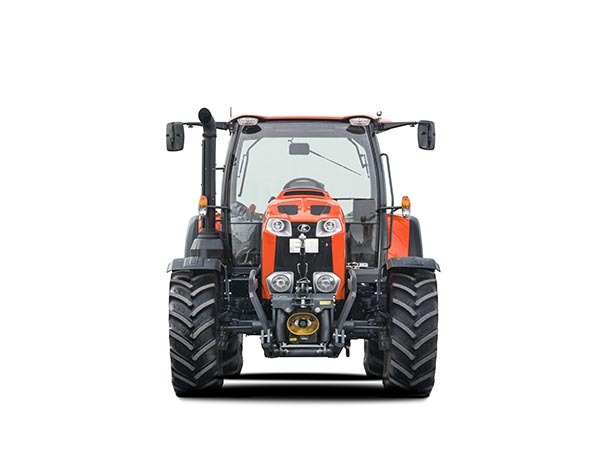 The power units in the MGX III series of tractors once again demonstrate that Kubota is a leading innovative company in the diesel engine sector. You will find the modern 4-cylinder V3800 on the M95GX III and the M105GX III. The models M115GX III, M125GX III and M135GX III have the 4-cylinder V6108 engines. Both engines fulfil the strict Stage IV final emission standards with confidence. The advanced/sophisticated combination of common rail injection, diesel oxidation catalytic converter (DOC), diesel particulate filter (DPF), SCR catalytic converter, and water-cooled exhaust gas recirculation (EGR) makes this possible. Not only does the environment benefit, but you do as well, in several ways: through higher efficiency, lower fuel consumption, and less engine noise. The proven Kubota reliability is all part of the package. Kubota lowered the maximum permissible speed of the V3800 engine for the MGX III from 2,600 rpm to 2,400 rpm. This improvement results in greater comfort for you. The engine not only benefits from lower consumption and less wear, it is also noticeably quieter. 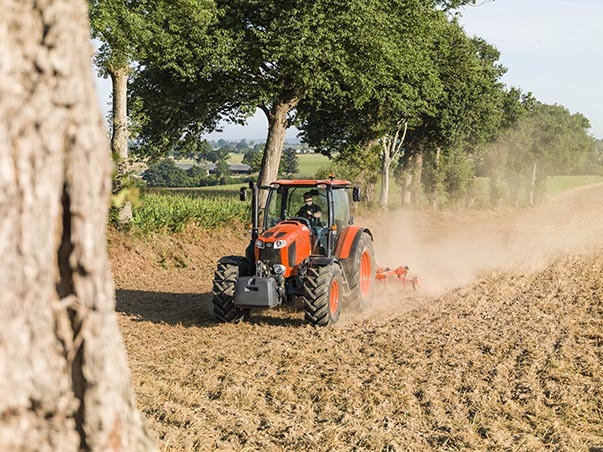 Furthermore, Kubota has optimised the power and torque curves of all engines. As a result, the V6108 engine reaches its peak output at a much lower speed. This also has a positive effect on cab noise and the fuel consumption of the tractor. Intelligent and user-friendly—with Intelli-Shift powershift transmissions you can change gears at the push of a button. The Kubota MGX III, however, has more in store to make your work easier. 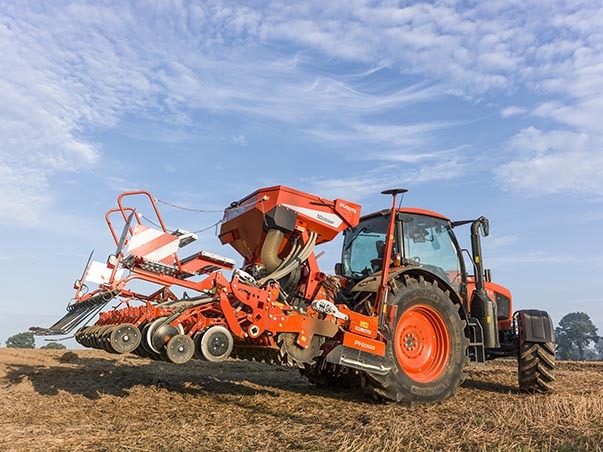 The automatic mode helps with changing soil conditions and sloped terrain. You simply need to steer, while the tractor changes the gears for you. With the Intelli-Shift transmission, the shift lever is used to easily change gears at the push of a button. Shifting up or down is equally simple. With unique in class eight powershift ranges in three groups, you have a total of 24 forward and 24 reverse gears at your disposal – the right amount to cover the widest range of applications. Depending on the situation, you don’t even have to raise your hand from the right-hand armrest to shift gears. Two additional buttons are within reach to change the powershift speeds. Highly developed microprocessor technology makes it possible to change gears smoothly under load, with no effort on your part whatsoever. By overlapping the powershift speeds, you can find the exact speed needed for the task at hand. This means maximum versatility and minimal shifting. With the optional creeper speed group, you can increase the number of speeds to 32 forward and 32 reverse gears. For operations that frequently require low speeds, such as harvesting vegetables or planting seedlings, this option is a must. Under changing soil and terrain conditions, the automatic mode is a true blessing. The principle here is maximising performance through automatic shifting. On the road with a trailer, the travel speeds are adjusted to inclines or downward slopes, depending on the load and throttle position. In field mode, the automatic function prevents too much engine droop according to the load and also the implement linkage position. You can fully concentrate on your work, even under challenging circumstances, without having to continuously think about changing gears. The extremely productive, high-performance hydraulic system of the MGX III handles heavy implements with ease. Whether you work with a combi seeder or a reversible plough, this tractor has the lift capacity to handle it all without a glitch. Is tough front loader work the order of the day at your farm? Here too the hydraulics of the MGX III provide top performance. High productivity is the objective of the MGX III hydraulics. The new MGX III series tractors are equipped with hydraulic gear pumps for the smooth operation of attachments and extra-fast front loader work. External hydraulic cylinders provide a greater lift capacity and simplified operation, while a new pressure relief valve minimises pressure loss. This results in more power for PTO work when the 3-point power lift is not in use. The MGX III has the muscle to lift very heavy implements. Thanks to generously sized external hydraulic cylinders, the 3-point Category III power lift can produce 6,100 kg (M115GX III, M125GX III and M135GX III) or 5,000 kg (M95GX III and M105GX III) of lift capacity. It easy and comfortable concept allows you to attach any equipment in no time. Several rear hitch options are available (depending on the market) offering strong coupling for heavy loads. Whatever the task at hand, the PTO shaft, with electrohydraulic clutch, (540/1000 rpm) can be used with a broad selection of rear implements. For increased productivity, the independent PTO shaft can be engaged and disengaged by simply turning the control switch. Automatic modulation ensures a gentle start without having to stop the tractor. The agricultural sector has nothing to give away. This is more true today than ever. With the retrofit ISOBUS and Precision Farming solutions for the MGX III, you can apply pesticides, fertilizers, and seeds in an efficient, precise, and economical manner. The tractor and productive resources are put to optimal use. 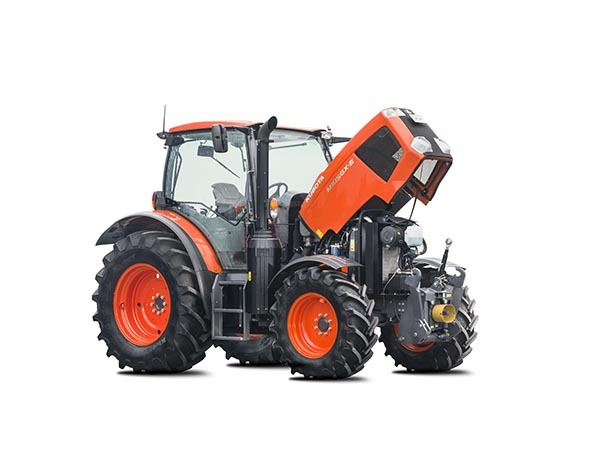 The Kubota MGX III can be equipped with retrofit kits, which means that your MGX III becomes an ISOBUS tractor with which you can use any ISOBUS device or machine on the market without limitations. This saves time and money, allowing you to complete your work stress-free. ISOBUS on board The terminals are ISOBUS-certified. The connector makes it possible to display the ISOBUS devices in the cab on the IsoMatch Tellus 12-inch or IsoMatch Tellus Go 7-inch monitor. All device settings can be accessed from the touchscreen display by your seat and you can adjust the monitors to your liking. The two operating terminals are certified according to ISO 11783, the ISOBUS certification for tractors and devices. Up to four cameras can be displayed on one monitor. On the terminals are some short cut switches that allow fast and easy switching between screens. 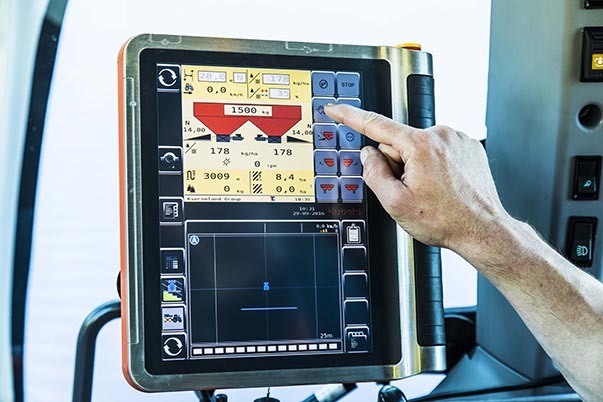 On the IsoMatch Tellus 12” are two different screens displayed at the same time, this means two different pieces of information or even two different ISOBUS machines. Wide-ranging assistance In addition of the ISOBUS terminals, a steering LED bar can be used to allow the driver to do manual guidance and increase the precision of the MGX III tractor. Efficient use of resources The GEOcontrol function included in the Kubota terminals, in combination with GNSS receiver allow you to use the section control application and/or the variable rate function. These functions can be used with ISOBUS implements for example the precision seeders, spreaders or sprayers. These functions save costs and resources by saving: time, overlaps, fertilizer, and seeds. With some tractor cabs, you have to be quite flexible just to get in. Not so with the MGX III, with its wide-opening doors. You can access the generous cab equally well from either side. Inside awaits a very roomy workspace and a deluxe driver’s seat with air suspension, where you will be at ease straightaway. A standard passenger seat is also available for instructing other drivers. All important control elements are positioned such that you can lean back and relax. You will also appreciate the noise level in the air-conditioned cabin, as it is pleasantly low. This is the optimal environment not only for long work days, but also for excellent quality of work. In terms of quality of work, the outstanding panoramic visibility of the MGX III makes its contribution. The 4-pillar cab features large non-reflecting glass surfaces. The unhindered views of all the attachment areas ensure that you won’t miss any obstacles and use the maximum implement working width left behind. Visibility at night is great too: four standard headlights and four powerful LED work lights as options, mounted on the cab roof turn night-time into day. You will also like the other cab features: the pop-up skylight for safe overhead work, the steering wheel with both tilt and telescopic adjustment for an optimal seating position, and the high-performance air conditioning and heating system. All of this contributes to more driving and operating comfort and increases productivity. According to Kubota, ergonomics should help you to operate and drive your tractor effortlessly. The arrangement of the control elements is therefore focused on ensuring a clear overview and user-friendliness. 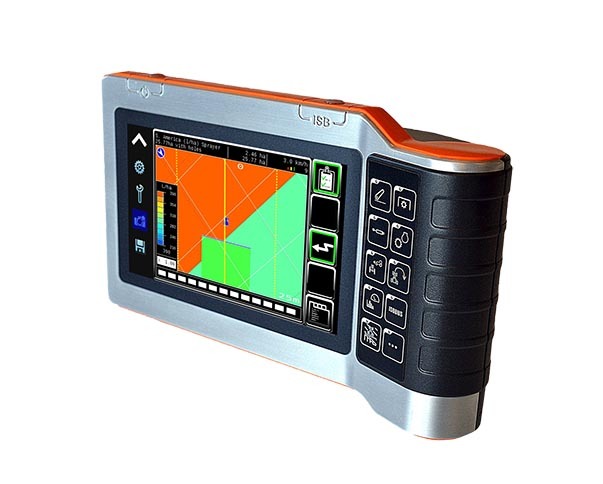 The operation of the MGX III is easy to understand and completely intuitive. You can thus give your full attention to the work at hand. The MGX III control panel is well arranged. All control elements are logically positioned and within reach. Clear colour-coding (orange: transmission, black: hydraulics, yellow: PTO shaft) makes operation fast, safe, and unmistakable. The clearly arranged control panel on the right-hand side of the cabin represents the command centre of the tractor. All control elements are located there and in the adjacent armrest. Everything is within immediate reach. There is no need to stretch, let alone to get up. The sun shield around the monitor makes for a trouble-free display of information, even on sunny days. The newly designed instrument panel provides an even better control of all important tractor data. Travel speed and the fill level of the AdBlue® tank are indicated, as are main engine and transmission information as well as the status of the front axle suspension. Smart switch elements typical for Kubota offer additional utility. Consider three examples: The speed limiter can be used to adjust the engine speed in increments of 10 rpm. The set speed is maintained consistently, less fuel is consumed, and the risk of overspeed in PTO shaft operations is reduced. The RPM Dual Memory switch can be used to preset two frequently used speeds. This saves time, as you don’t need to throttle back the engine to the required speed, allowing you to focus on the task at hand. Kubota RPM Work Cruise is also a very useful feature. The electronic controller ensures a constant engine and PTO shaft speed. In combination with the automatic mode of the transmission, the quality of PTO-driven machinery work is increased. The use of a baler on hilly terrain is a perfect case in point. 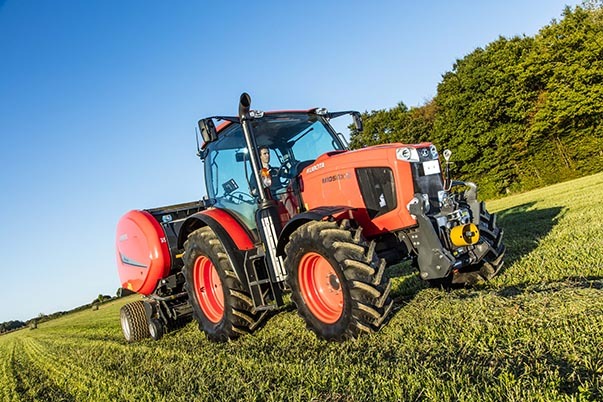 When the tractor and front loader are made by the same manufacturer, you can rightly expect a well-matched product package. In the case of the MGX III, your expectations will be exceeded. This is technology from a single source, raising the efficiency and performance of front loader work to new levels with intelligent solutions. 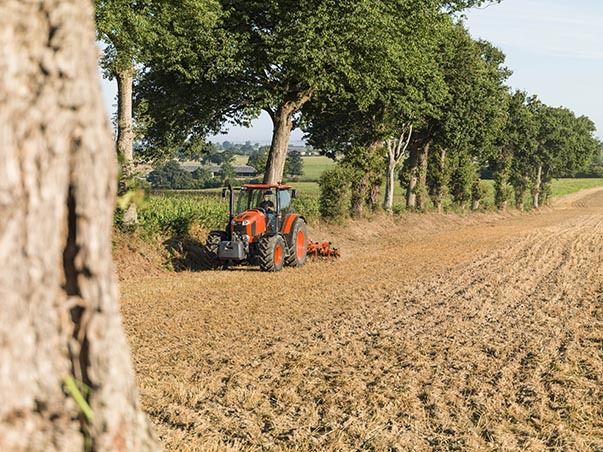 Simple operation and quickness are two decisive features that define the combination of the tractor and front loader from Kubota. Both have the perfect prerequisites for highly efficient work: the tractor with a great view of the equipment, including the raised front loader through the pop-up skylight, and the front loader that offers fast mounting and removal as well as a user-friendly design. The very good visibility towards the front loader increases the safety, talking about safety: the anti-lowering valves lets the front loader maintain in his position even in cases of hydraulic pressure lost. Attaching and removing the front loader could not be simpler. The integrated supports and two connection pins turn this into a breeze, without the use of any tools. The Euro quick coupling guarantees mounting and removal of manure forks, pallet forks, bale forks, or buckets in seconds. Connect the hydraulic lines just as quickly – the single-lever hydraulic quick coupler makes it simple. Convenience is just as important for a Kubota front loader. 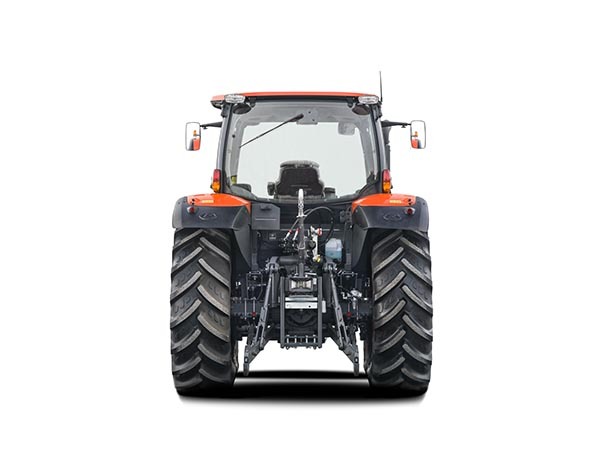 The KSR (Kubota Shockless Ride) vibration damping system minimises the shock loads that normally arise when the tractor is working at high speed, for example, thus reducing the load on the driver. With an optional valve for the third hydraulic function, or even a fourth hydraulic function, you can increase the number of possible front loader applications even further, for example by adding a grab bucket or other hydraulically controlled attachments. Need to get up high or versatile front implement? Thanks to the outstanding traction and unique maneuverability of the MGX III, you can master any situation in the field, on the road, or on the farm—and be astounded. You will see: even under tough conditions, this tractor will still manage to increase your productivity. The outstanding maneuverability of the MGX III pays off wherever you go. In the headland, for instance, where you can turn in one motion without having to back up or take a wider turn. Or in tight farmyards, where you can take every corner with confidence. What makes this possible is the ingenious bi-speed turn system from Kubota: from a steering angle of 35°, it automatically increases the speed of the front wheels. This makes the tractor extremely maneuverable. 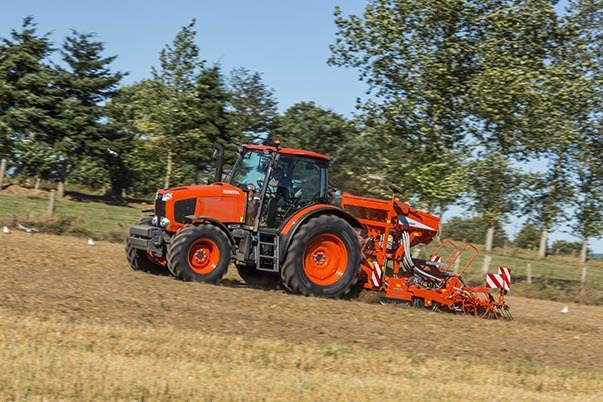 The uniquely tight turning radius of the MGX III is also based on its front axle with bevel gear drive – another advantage exclusive to Kubota. With a legendary 55° steering angle, you can maneuver with confidence, even in the tightest spaces. Speaking of advantages: on account of the bevel gear drive, the MGX III has a higher ground clearance than tractors with universal joint front axles. As a result, you can drive among tall crops where other tractors can’t go. Even large swaths of hay remain undamaged. The large wheelbase of 2.690 mm on the models M115GX III – M135GX III is very beneficial for the traction performance in heavy work conditions. All MGX III models can be optionally equipped with a front axle suspension system. This is a wise investment, as it provides not only greater driving comfort and safety, but also greater tractive power to the ground. You will appreciate the comfortable driving experience without experiencing fatigue. When soft, muddy ground threatens to slow you down, just switch on the electrohydraulic differential lock on the front and rear axles – and you are off and running again. Use the front axle differential lock for straight travel in field mode when slippage occurs. Turning is made easier in all-wheel drive mode. Another useful function is the automatic all-wheel drive mode. Once it is activated, the tractor automatically switches from four- to two-wheel drive as soon as it is travelling at a speed faster than 20 km/h. At less than 17 km/h, the all-wheel drive comes back on. The advantages are less tyre wear and lower fuel consumption. Braking performance also improves, which is of great benefit for road travel with a heavy trailer in particular.